Stamp it, Scrap it, Share it: Fabulous Friday! Good Afternoon! I am a little late with my post today. I started this card last night but my son wanted to talk with me so production stopped. I decided to play along with a challenge I've not done before, this is for DCRU, or rather A Crafty Little Place. It's a great sketch by Lori Boyd and was a lot of fun to make. I used stamps from the Spring Pixie Kit by CC Designs. I just love this set and I try to incorporate it into as many cards as I can. Thank you for stopping by - I hope you have a really enjoyable weekend!! this is darling. love the embossing too. This is adorable - thanks for your sweet comments on my blog! 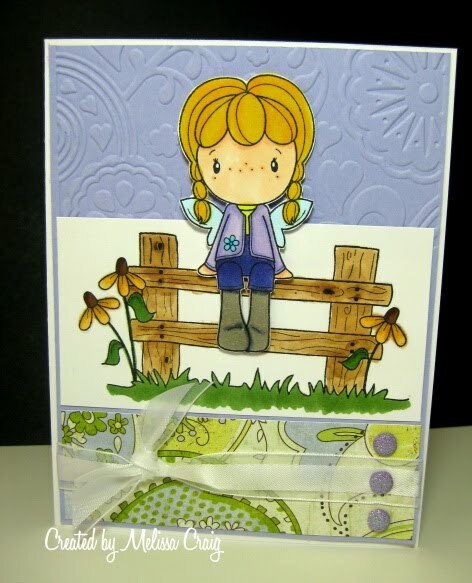 Mel, I adore your sweet little Swiss Pixie card. You've done a superb job with our sketch at A Crafty Little Place. Thanks for playing along...I hope we see you back very soon! Hi, Mel! Adorable card! Thanks for sharing with ACLP! Hi Mel!! Love your coloring and textured background!! Thank you so much for playing along with us!! Oh Mel...you have picked the perfect image for this sketch!! So happy you shared with ACLP this week!! Love your card! The stamp is adorable and colored beautifully!